If you had stopped by 20 Ellery St. a few weeks, you would have found me and Jonathan waiting anxiously, like 10-year-olds with upcoming birthdays, for the UPS guy. We startled at every faint rustling coming from the direction of the front door. We raced down the stairs at every ring of the doorbell. We almost became hysterical when, on the day that our package was supposed to arrive, the UPS guy was late and didn't make our delivery until 3pm. What, you ask, could possibly evoke such giddy enthusiasm from two jaded and sarcastic 20-somethings? Well I'll tell you: it was an ice cream maker. Jonathan picked out a wee Krups machine, which has a removable freezer bowl and a cute plastic churning paddle. I can't say I'm completely confident that the whole contraption will survive much longer than a few months, but as far as I'm concerned, the pure excitement surrounding its advent is worth the price (which, as you might imagine, was not very steep). 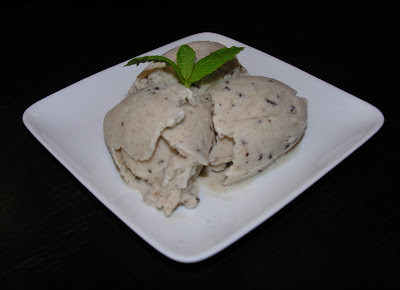 Just a couple weeks into our ice cream-making careers, we have already turned out several successful batches. 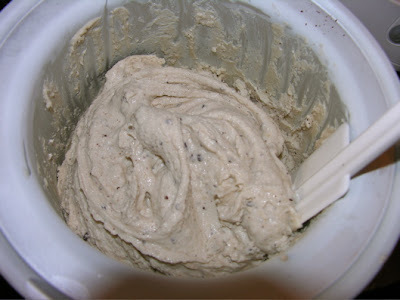 Our first go was a low-fat mocha gelato, which we thickened with cornstarch instead of egg yolks, and which was speckled generously with grains of freshly-ground espresso powder. Rave reviews, although even I, the obsessive healthy-food taste rationalizer, can't say that low-fat is the same as the real thing. We opted out of dairy for our second experiment: apple cider sorbet, made with fresh apple cider and locally-grown MacIntosh apples. The sorbet was a deep caramel color, with the unmistakeable taste of real New England apples (the best). Next came an attempt at frozen yogurt....but we have decided that it shouldn't be spoken of again. So we'll update you when we've found a post-worthy fro-yo recipe. Last night, though, was our crowning achievement: thick, delicious, perfectly-textured, honest-to-goodness ice cream. We made banana (flecked, of course, with a little Valrhona 70%) because we had a few ripe specimens in the kitchen. We started the egg-based custard late Friday night, chilled it overnight, and churned it to creamy perfection late yesterday afternoon. We popped it back into the freezer for a few hours (after a preliminary tasting), and it was ready to scoop and serve by dessert-time. We invited some friends over to share in our culinary joy, but most of them couldn't make it. Too bad - we had to eat it all ourselves.